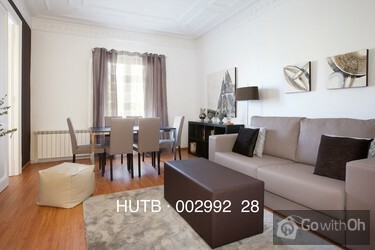 This apartment features an elegant and carefully designed decoration. Thanks to its fantastic location at the heart of the city, this apartment is an excellent choice that will allow you to comfortably reach Barcelonas most important places of interest on foot and fall in love with this charming city. 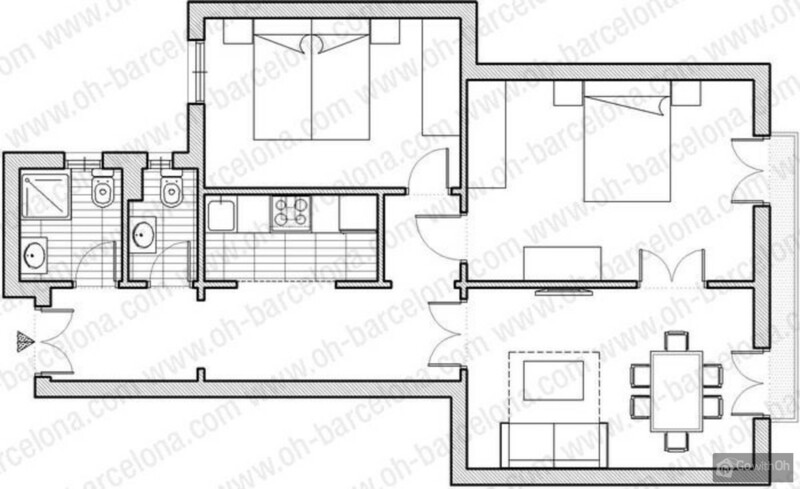 The 70m2 apartment is located on the third floor of a building with a lift in the Eixample district and is designed to accommodate up to 6 people. The living room come dining room is bright and cosy, its large windows and high ceilings contrasting nicely with the beautiful, earth toned furniture. Here you will find a double leather sofa-bed, a flat-screen television and a Wi-Fi internet connection. You will also be able to enjoy a pleasant meal with your family or friends at the large dining table. The independent kitchen features a full range of equipment. Further on you will find the two, tastefully decorated bedrooms - the first has a double bed, whilst the second contains two single beds. Finally, the bathroom features a shower, and the apartment also possesses an additional WC for extra comfort. Check-out between 06:00 and 12:00. Payment for the rental and the refundable deposit can be made by credit card (only Visa or Mastercard) or in cash. 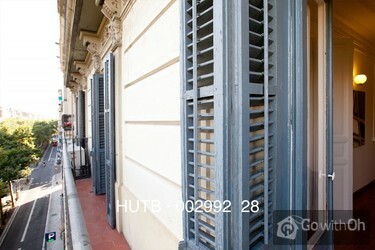 The owner has another similar apartment available on the same floor  see ref. 16564. Reservations are not accepted from people younger than 25. 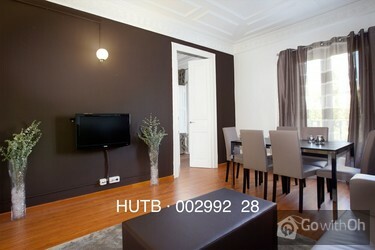 The apartment was great, perfect for us, a grouup of 3 adults, and able to have meals together with friends. The location was perfect and central. All staff arrived exactly when they said they would and were friendly and helpful. L'appartement est parfaitement conforme aux descriptif et photos disponibles sur votre site. Simple bémol sur le fait que quelques éléments seraient à soigner comme par exemple les finitions (seuil de porte absent entre salon et couloir - Ampoules à économie d'énergie très faibles et très ...froides - double vitrage côté rue très passante)ou encore l'entretien (Variateur lampe chambre defectueux obligeant à dévisser l'ampoule pour éteindre...) Mise à part ces détails peu importants, appartement parfaitement satisfaisant et très bien situé, très central. Mit etwas Englischkenntnissen kommt man ganz gut durch. Die Kontaktpersonen sind alle sehr freundlich. Die Lage der Wohnung ist relativ zentral und nur wenige Schritte zur Metro entfernt. Da die Metro an unserem ersten Tag streikte, war der Verkehrslärm auch bei Nacht sehr enorm. Wir waren aber so... fertig, daß uns das nicht weiter störte. Die Wohnung ist sauber und mit allen notwendigen Dingen ausgerüstet. Die Dusche ist allerdings nur für kleine, schmale Menschen konzipiert. Ich hatte so meine Schwierigkeiten. too noisy and we got no sleep for 3 nights! the bathroom is terrible and small. The second bedroom smells thru the window as all building bathrooms smell come thru and there is no TV for english speaking customers which is disgraceful. we would not recommend it to anyone. your staff should have warned us about all this at time of booking. The kitchen was very small, but well equipped (although it needed some oven dishes). The sofa bed was very uncomfortable opened out, my 18 yo son had to sleep on it unopened. We sometimes caught a stale smell from the drains first thing in the morning. However, on the plus side, the contact people ...M. and M. were very friendly and helpful (and very punctual). 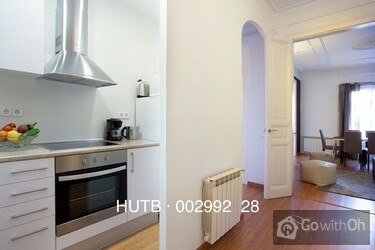 The apartment was very clean and spacious, well decorated and in a great location. While there is some noise from the street outside, we didn't find it intrusive. Would definitely stay there again, but would rent the larger apartment from the same owners in the same building. We wouldn't hesitate to recommend it to anyone as a great base for your Barcelona experience (but only as a very comfortable 2-bedroom, sleeps 4). bel appartement,super situation à proximité de tout les grands sites.au niveau de l'appartement,celui-ci est spatieux correspondant au descriptif.il manque juste un peu de vaisselle.pas de tire bouchons par exemple,pas de tasse.ceci reste un détail.beau sèjour.